This lightened version still delivers the same classic flavors. Combine mayo and Greek yogurt to keep it light and cool. Prepare green pepper by washing, drying, and hollowing out the inside to use as a bowl. Place chicken (water removed) into a small mixing bowl and break with fork. Add Mayo, Greek yogurt, salt, pepper, and celery. 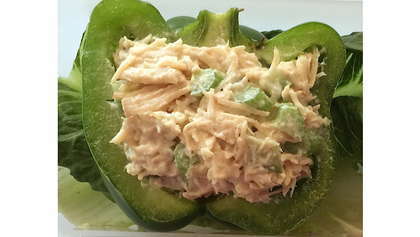 Scoop mixture into green pepper. Serve with whole grain bun or whole grain crackers. Recipe can be doubled, tripled, etc. as needed.